Horrible news this morning as a two-year old boy fell to his death last night after the LA Laker's game. The LA Times is reporting that LAPD's child abuse unit is looking into the case. A 2-year old boy died after falling 50 feet from a Staples Center luxury suite after Sunday night's Lakers game, and the death is being investigated by the LAPD's abused-child unit, officials said Monday. The boy was taken to Los Angeles County–USC Medical Center, where he died, said Officer Julie Sohn, a spokeswoman for the Los Angeles Police Department. 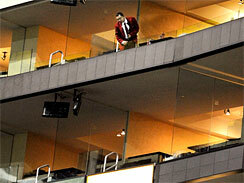 He fell from the top level of luxury suites several minutes after the game ended Sunday. It is unclear what the boy was doing before he fell. Witnesses told The Times the boy was moving his arms, legs and head before paramedics took him out of Staples Center on a stretcher. I'm highly skeptical that there will be charges. In fact, I'm willing to bet that the reasoning behind the Child Abuse Unit's involvement is more procedural. However, this is sports and CA, so I wouldn't put up any money on it. Reports are saying that the boy was leaning over, trying to take pictures. KTLA-TV says it's believed the child was taking pictures when he plunged to the concrete floor. OC Register reports that the assigning of the LA Child Abuse Unit is standard procedure given the age of the child. French said the investigation is being conducted because of the age of the child and it does not necessarily indicate foul play or abuse. This story keeps getting only more tradgic the more information that gets released. LA Times reports that Lucas Anthony Tang would have turned 3 in January. Also, parents had lost sight of their child and were in the process of looking for him when the incident occured. The boy, Lucas Anthony Tang, had been crawling around the suite during the Lakers' game against the Golden State Warriors, sources said. At some point, his parents noticed he was missing and began to look for him. They did not know then that their son, who would have turned 3 in January, had fallen. Witnesses at the game told The Times that the boy was moving his arms, legs and head before paramedics took him out on a stretcher. Corrections Made: Title was altered as more information regarding Child Abuse Unit's involvement was clarified by the police. Update x2 was deleted due to it's speculative nature. That is obviously not the same baby, as the child in the story would have been 3 in January.